Summary and Definition: The Natchez tribe lived in the area of St. Catherine’s Creek, east and south of the present city of Natchez, Mississippi. Others later settled in South Carolina. The Natchez Indians were successful hunters, fishers and farmers, growing corn, beans, and squash. The culture of their ancient civilization ended as Europeans encroached on their lands. The ancient ancestors of the Natchez are believed to have once been part of the Mesoamerican empire. These ancient civilisations such as the Incas, Aztecs, Mayans and Toltecs encompassed many parts of South America and ancient Mexico. The ancestors of the Natchez once inhabited the southwestern portion of the ancient Mexican empire, but began to move northeast and finally settled upon the banks of the Mississippi in A.D. 700. The people retained many of the religious beliefs, ritual and customs of the Mesoamericans. 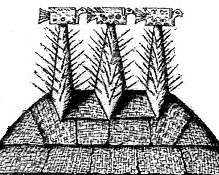 The Quigualtam, famed for the Winterville Mounds, are considered to be the ancestors of the Natchez. The customs and traditions adhered to by the Natchez included the wearing of elaborate feather mantles during ceremonies and rituals. In 1250AD: Mississippi's Emerald Mound was constructed and other similar mounds were built. Their religion centered around a temple and and shaven head priests, similar to the temples of Mexico and South America. They had four social classes: the Suns, the Nobles, the Honored Men and Honored Women and the lower class (known as the Stinkards). The people were sun worshippers and the Natchez chiefs were called the 'Suns'. The people were ruled by the Great Sun regarding all civil matters and his brother, Tattooed Serpent, in matters of war. The Great Sun and the Tattooed Serpent lived at the Grand Village. Lesser Suns from the royal family ruled other Natchez villages. Human sacrifice and ritual suicide formed a part of their culture. The wives and members of the entourage of the Great Sun and the Tattooed Serpent (up to 100 people) were expected to perform ritual suicide upon the death of a chief so that they might accompany him into the afterlife. The ancient Mississippian culture of the Mound Builders of North America were major elements in the Southeastern Ceremonial Complex of American prehistory (S.E.C.C.) The ancient Natchez culture ended with a series of Natchez Wars (1716 - 1729) against the French. Where did the Natchez tribe live? The Natchez are people of the Southeast Native American cultural group. The geography of the region in which they lived dictated the lifestyle and culture of the Natchez tribe. What did ancient Natchez tribe live in? The picture shows the Sun Temple and the Chief's house in the Grand Village of the Natchez. The structures were built on mounds that were about eight feet high and approached by one flight of steps. They were constructed by using a framework of poles and beams covered with wattle and daub mud. The walls were covered by cane mats and a thatched grass roof. The outer layers of the house walls, and the roof, were neat and carefully clipped. The interior walls were also lined with woven mats. The Grand Village of the Natchez was organized around an open plaza with two eight feet high, flat-topped mounds at either end. On one mound was the residence of the Great Sun, and on the other mound was the Sun Temple, containing the perpetual fire and a platform with the bones of the previous Great Sun. The structures had no windows and only one door which faced east in the direction of the rising sun. Other houses in the Natchez village were built in a similar fashion, but were not constructed on the top of mounds. The painted symbols displayed on the top of the Natchez Sun temple are very similar to the mythical beings called the Piasa and the Great Serpent that featured strongly in the Mississippian culture. The Natchez temple was used for elaborate funeral rituals, human sacrifice including the ritual suicides. The people believed that the Underworld was inhabited by spirit snakes or serpents and that the Upper world was inhabited by spirit birds and the people of the earth who were ruled by powerful spirits like the Piasa and the Serpent. What language did the Natchez tribe speak? The tribe spoke in Natchez, the ancient language of the people, distantly related to the Muskogean languages. What did the Natchez tribe eat? The food that the Natchez tribe ate were based on the crops they farmed of corns, beans and squash. They also hunted for meat and fish gathered wild plant foods. Food was cooked into soups, bread, cornbread and hominy. The people also grew a grain-bearing grass and tobacco. They obtained salt from Caddo tribes to the northwest. What weapons did the Natchez use? The weapons used by the Natchez included war clubs, maces, knives, bows and arrows, pikes, axes, and they sometimes carried shields. The clothes of the Natchez men were limited to breechcloths made from mulberry tree inner bark fabric and/or deerskin. The women wore a knee-length skirt, also made from a bark fabric. The children went naked until the age of about ten years. Both Natchez men and women painted their faces for special occasions and also decorated their bodies with tattoos. The Natchez chiefs and nobles wore beautiful feather cloaks or mantles of parakeet, crane, turkey, woodpecker, hawk, eagle, swan or duck feathers. The feathers overlapped each other and were attached to a net made from the roots of nettles, silk grass or mulberry bark fibers. For special ceremonies these feather cloaks reached ankle length. The Great Sun wore a magnificent crown of red tasselled swan feathers, the Natchez nobles also wore distinctive feather headdresses. The Natchez Native Indians began to change their style of dress soon after their first encounters with Europeans, as can be seen by the picture of the Natchez Native Indian at the top of the page. During the 1800's cloth became even more readily available. They used strips of cloth, such as wool, calico or even silk, wrapped around their head like a turban. The turban style headdress was often decorated with a feather plume which were considered to be of spiritual significance and held great power. The next favored item of clothing of the Natchez was an outer garment called a matchcoat. A matchcoat was basically a blanket that was fastened around the body, often fastened around the waist with a sash. Sometimes matchcoats were hung over their shoulders or in warm weather just fastened around the middle. In cold weather matchcoats could be arranged to cover the head. Natchez History: What happened to the Natchez tribe? The following Natchez history timeline details facts, dates and famous landmarks of the people. The Natchez timeline explains what happened to the people of their tribe following the arrival of the Europeans. 1650: The Natchez population was about 5,000 to 4,500 in 1650 and 300 in 1731. Natchez settlements are now in the southern half of the Mvskoke reservation and the west central part of the Cherokee reservation in Oklahoma. Two Natchez communities are also recognized by the state of South Carolina.